Construction companies that aggressively moved to diversify into other countries during the downturn in Dubai property have seen their shares sold heavily due to the political turmoil in the Mena region. Several UAE developers and builders have expanded into Egypt, Saudi Arabia, Libya, Tunisia and Bahrain in recent years. Diversification was considered a crucial ingredient for companies looking to avoid overexposure to the struggles of the Dubai property market. Now such diversity is viewed as a negative. “Clearly you have to invest money based on risk appetite and this increases the risk,” said Chet Riley, an analyst with Nomura Securities. 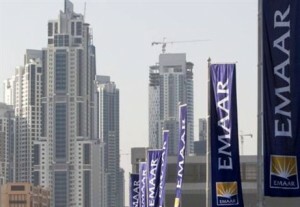 Shares in the Dubai developer Emaar Properties are down about 25 per cent since the start of the year, and those of the construction giant Arabtec Holding have fallen by about 36 per cent, in part due to their newly diverse portfolios, analysts say. Egypt has become a key market for several UAE builders. Emaar, best known for constructing the Burj Khalifa – the world’s tallest building – in Dubai, now has projects valued at Dh4.2 billion (US$1.14bn) in Egypt, about 15 per cent of its book value. Arabtec announced a Dh195 million contract in October to build the Hanging Gardens, a 2.2 million square metre development on the Red Sea. “This award comes as part of the company’s strategy to diversify geographically outside of the UAE,” Riad Kamal, the chief executive of Arabtec Holding, said at the time. Arabtec also signed a joint venture with Musawa Holding in October to open an operation in Bahrain. The market may be overreacting to Arabtec’s exposure to turmoil, said Mr Riley. Many of the projects are in the early stages, limiting the company’s downside. “How much capital have they committed to it? Very little,” he said. Drake & Scull International (DSI), the Dubai construction company, announced its first deal in Egypt days before demonstrations broke out on the streets of Cairo this year. The Dh465m deal calls for DSI to help build the Nile Corniche Project in Cairo. DSI’s Saudi Arabia subsidiary last month announced a 2bn riyal (Dh1.95bn) deal to help build a petroleum research centre for Saudi Aramco. DSI also opened an office in Libya in 2009. Only about 30 per cent of DSI’s backlog of projects is in the UAE after the recent expansion in Saudi Arabia, he said. Damac Properties, the Dubai developer, has five projects in development in Egypt, including Gamsha Bay, a 20 million sq metre project on the Red Sea, and two projects in the New Cairo development with 590 residential units. The turmoil has had “limited impact” on the developments, a company spokesman said. “Our construction sites are once again active and construction is progressing well across all our projects in Cairo,” said Niall McLoughlin, the senior vice president of Damac. The company “remains optimistic about its future in Egypt, and we are confident that the country will continue to be a very important market for us,” Mr McLoughlin added. Buyers in Emaar’s Egypt projects under construction have typically paid instalments representing about 70 per cent of the purchase price, which lowers the risk of defaults, Mr Riley said. And companies such as Emaar already with a foothold in troubled countries may be well positioned when the situation stabilises, he said.